I never got the original Tahu. He was the posterchild of the Bionicle line, his red mask was emblematic of the kanohi, and he was the one in front in all the group shots. Still, I just didn't like him. Tahu Nuva is still the "main guy" in all the advertising, but I think the Nuva-ization has helped him out a bit. 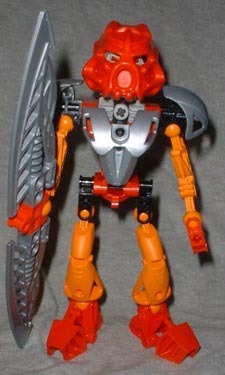 Tahu Nuva is basically the same as original Tahu--big red body, orange limbs, red feet and mask. His weapon is still a fiery sword (though it does look less like a representation of actual fire and more like a representation of a fire design, if that makes any sense), but he now has two blades instead of one. Whether you want two weapons or one double-height blade is up to you. A gear in his shoulder lets him swing his magma swords, and the set includes enough pieces to either let both of his arms move or to hold them both in place. One of the new features with the Toa Nuva is that their weapons serve more than one purpose; mainly, they can turn into a means of transportation. 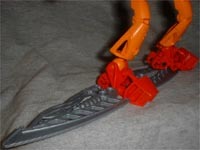 Plug Tahu Nuva's swords into his foot, place the other foot at the tip, and you've got a big grey surfboard. I have to admit, that's pretty cool. Depending on which way you have him leaning, he can ride either at the front or rear of the board. The silver protodermis armor (actually a translucent plastic that has a metallic dye suspended within) doesn't look too bad contrasting with Tahu's red, but it doesn't look as good here as on Kopaka. The football pads fit well with the oversized, helmety Hau Nuva, which looks only somewhat like its kanohi predecessor. The mask provides the user and those around him protection against the most powerful attacks, but not against strikes from ambush. Bionicle is continuing the tradition it began last year with fun toys and an engaging story. The Toa have been updated, and Tahu is looking better than ever. Do you like the Bionicles, or are you a flaming idiot? Who's your favorite? Tell us on our message board, the Loafing Lounge.